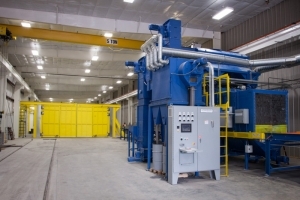 Pro Blast Technology has a Wheelabrator for abrasive blasting, also called shot blasting, surface preparation, and industrial equipment cleaning. Wheelabrator machines convert electricity into abrasive energy by rotating a wheel with vanes or blades. They propel special recyclable abrasives to remove rust, scale, corrosion, and paint from a variety of parts including structural steel and pipe. This process is called wheelblasting, and each wheel can move 700-1000 pounds of abrasives per minute. The Wheelabrator has an envelope of 36″ x 48″. Older technology used sand as the abrasive material, but it had to be strained to make all the grains a uniform size. New abrasives come in several uniform sizes for different uses, and they look like very small ball bearings. 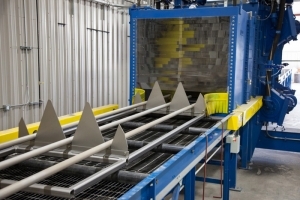 Wheelabrator machines have several wheels, so they can clean large industrial parts, structural steel, pipe and equipment from all sides at once. 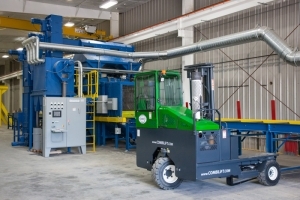 Our Wheelabrator also possesses technology to clean one side, top or bottom or any combination thereof. Abrasive blasting leaves a slightly rough surface so that new paint and other coatings adhere well and resist corrosion. Shot peening enhances the strength of components that could be exposed to high stress or fatigue, like structural steel for buildings or vehicles, and improves the performance of parts that are critical for safety. In such cases, instead of abrasives, the wheelabrator hits surfaces with round metal, glass, or ceramic particles called shot. This causes thousands of tiny dents that compress the metal. These dents delay or prevent cracks in components under stress. The peened surfaces eventually become encased in a compressed layer that extends the lifespan of many different types of parts. Pro Blast Technology has an 18′ tall, 18′ wide, 60′ long blast room, a 14′ tall, 24′ wide, 40′ long blast room and an 8-wheel Wheelabrator with a 4’X4’ opening for all types of applications. We can also use our mobile onsite services to help industrial plants, manufacturers, fabrication shops, mining companies, contractors, loggers, and more. No job is too big or too small. Please contact us for more information.